CM: Cris Gianakos' Not Identical Twins is part of a long series of work, in which figuration comes in dialog with abstraction. The earliest instance was the Archaic Head presented at A.D. Gallery, Athens, in 1991. The next one was the Kouros Head presented at the European Cultural Centre of Delphi in 1994. The most recent was the Ephebe Head at Portalakis Collection, Athens in 2000. In all the aforementioned Heads the issue is with 'mystery' as a timeless concept. Gianakos' Heads reveal the unfathomable dimension of the void. 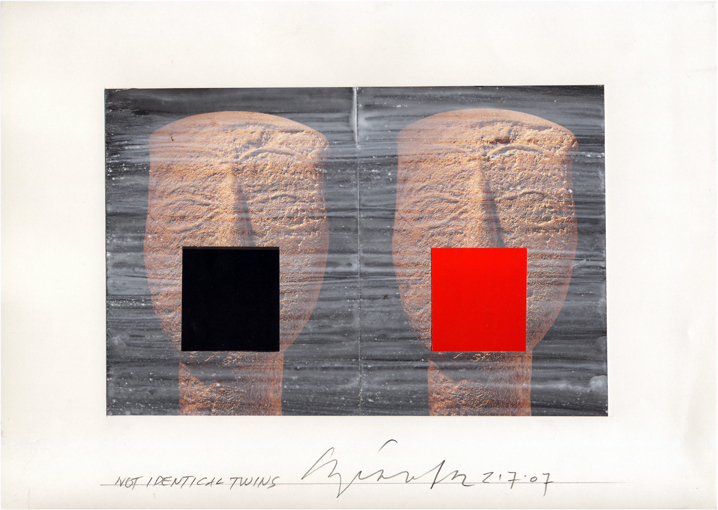 For Not Identical Twins Gianakos appropriated a couple of identical postcards from the Museum of Cycladic Art, presenting a detail of a figurine's head, by brushing over them a white acrylic wash, and collaging two squares - black and red - over the head's mouth and nose. For Gianakos black is the color of the void, whereas red signifies blood. Gianakos is clear that these squares are not covers, but rather floating planes. As such, the squares are metaphorical of people's personas, as influenced by desires and hindrances, norms and conventions. The Cycladic head with its pronounced anatomical aprticularities - especially its wide-open eyes - yields a strange impact. The irregular geometricality of the head - it's shape could well echo the pithos jar - is complimented by the purity and perfection of the square. Unlike previous of Gianakos heads, this is the first time he uses the repetition, in keeping with the Duchampian affection for reproduction. Though however the main source is the same, the two colors used for the squares planes endow the identical Cycladic heads with complimentary qualities.